Should you be eating a lot of fruit? Eating a diet high in whole fruits and vegetables leads to lower heart disease risk, right? At least that's what most nutritionists are continuously telling us. It's true that population studies show this connection. 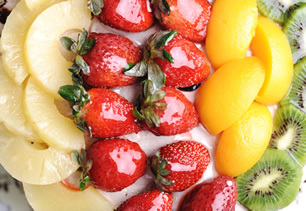 But if you know me, you know that there is also no doubt in my mind that for the majority of Americans, a diet high in fruit is not a good choice, as it can lead to all kinds of medical problems. So what is it? Is it the vegetables or the fruit that decreases heart disease risk? Or is it a combination? A new review on just this topic answers the question. The author of the paper examined the results of 57 studies to find out what it was about vegetables and possibly fruit that decreased the risk of heart disease. According to the evidence, the link is nitric oxide. For readers not yet familiar with nitric oxide, let me briefly explain. Nitric oxide is a free radical molecule produced through oxygen metabolism. Although many people think that free radicals are bad or unwanted molecules, nothing could be further from the truth. In reality, the right amount of free radicals is absolutely essential to our health. And this is definitely true of nitric oxide. Your body produces nitric oxide in the endothelial cells. These are the cells that line your arteries and capillaries. The effect of nitric oxide is to open up and dilate the arteries and capillaries so that more blood and oxygen can be delivered to the cells. So when there is not enough nitric oxide present, the cells become deprived of adequate circulation and heart disease can develop. Of course, other diseases such as high blood pressure, strokes, cancer and diabetes can also result. And that's where the vegetables come in handy. For years scientists thought that the only way the body produced nitric oxide was in the endothelial cells. But now that thinking is changing because researchers have found another way. And it may be just as important as endothelial production. It's called the nitrate-nitrite pathway. And it works like this. Nitrate is found in large amounts in vegetables. When we chew vegetables, the bacteria in our mouth convert the nitrate into nitrite. (That's why it's important to avoid antibiotic mouthwashes by the way. They kill the bacteria that make the conversion.) Your body then absorbs the nitrite and converts it into nitric oxide. According to the author of this paper, the nitric oxide formed this way accounts for a significant amount of the body's total nitric oxide levels. But here's the thing. Fruits contain very little nitrate while vegetables account for up to 85% of all the nitrate in our diets. So it's clear that the cardiovascular benefit we see from diets high in vegetables and fruits is because of the vegetables, not the fruit. But what if you already have cardiovascular disease, high blood pressure, or diabetes? In that case, make sure your diet is high in vegetables, especially the green leafy kind. And avoid fruit with the one exception of berries. Most fruits are just too high in sugar and may actually make your disease worse. And to get even more benefit from nitric oxide, you can take a product called CircO2. CircO2 is high in nitrite and nitrate, as well as the nutritional cofactors that help the conversion to nitric oxide. The CircO2 combination has been shown in studies to be an effective and easy way to boost nitric oxide levels. And it's very safe to take every day. Machha A, Schechter AN. Inorganic nitrate: a major player in the cardiovascular health benefits of vegetables? Nutr Rev. 2012 Jun;70(6):367-72.